Dutchman Falls is another tribute to the late modeler and great friend, Malcolm Vordenbaum who hand laid almost all of the complex track work and switches on the Sue Line, working on his kitchen table in Wichita Falls, Texas. This is a small example of the type of track work that Malcolm Vordenbaum did (above). Malcolm Vordenbaum was known as the Dutchman to his friends and he lived in Wichita Falls. From this, the name Dutchman Falls was derived in his memory. Once again the map (above) was designed and drawn by Sue Line Crew member Charlie DeVillbiss. Here we see that the Ferne Bridge (above) is dual track. The east track (rearmost) is the mainline and the west track (front most) is the track to Dutchman Falls. The north most industry in Dutchman Falls is the Texaco Bulk Plant (above). Moving to the south, we next see the Wildcat Oil Company (above). Continuing south, we next see the American Pipe Company or AmPipe (above). Continuing southward, we see the Master's Bait Company. keeps me alive- otherwise- I would be fish bait! is named for by youngest son's wife. It is her maiden name. 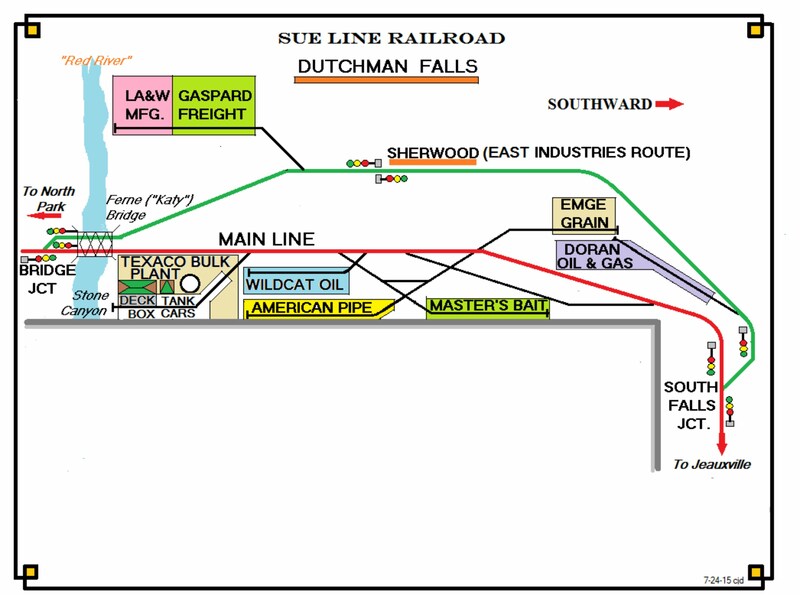 mainline, but scenically appears to be in Dutchman Falls. the towns on the layout appear larger.